Spray Toner on to clean dry skin in order to prepare the skin for adhesives. Spray Toner on to clean dry skin in order to prepare the skin for adhesives. Formulated exclusively for Richard Farrell. Toner is an excellent blend of astringents and analgesics that contain Tea Tree Oil, a natural germicide and fungicide and a mild peppermint oil fragrance. 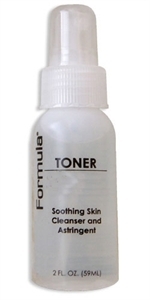 Toner cleans and refreshes itchy and oily skin caused by perspiration and extensive system wear. Toner has been proven to be safe on human skin.